Nice form of star jasmine with large sage green leaves edged in cream. New growth emerges a very pretty pink. From June to August a continuous supply of clusters of sweetly fragrant ivory flowers. To 12′ tall and twining. Provide sturdy support. 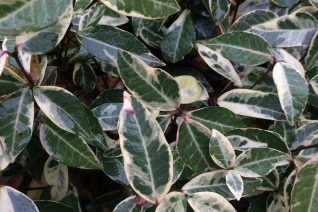 A nice attribute of Star Jasmines is their habit of keeping their foliage densely to the ground- never any bare knees. Takes full sun to quite a bit of shade- and still blooms. Slightly more tender than the species it requires a protected location- against a wall is ideal. Regular summer water speeds growth and this intensifies the re-blooming. Evergreen. Moderate deer resistance. 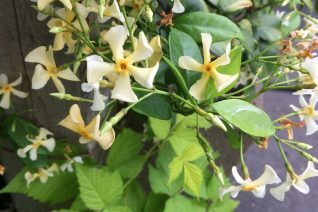 Reputed to be a hardier form of Star Jasmine, we really haven’t witnessed that. It seems just as hardy as the commonly grown clone. But it has several important differences. 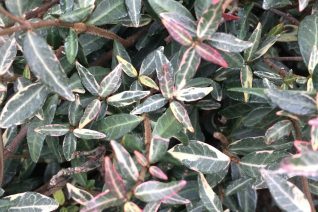 The large deep green leaves are conspicuously convex and thick. In June to September it alights with tons of ivory colored pinwheel shaped flowers. These are slightly smaller but come in such fragrant abundance that it doesn’t seem to matter. Evergreen from the base to the top which is nice. No bare knees. Full sun to quite a bit of shade in rich, well drained soil. Summer water speeds both growth and early establishment. Then light regular summer water. Moderate deer resistance. Twining to 15′ provide support. Fences, pergolas. 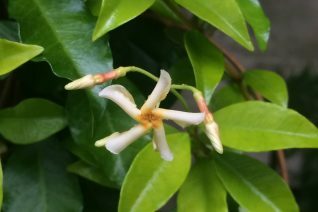 The apricot hued flowers of this Star Jasmine species are not the only difference in this elegant evergreen vine. The fragrance is different too with much more of a balmy citrus scent. Vigorous twining vine for part shade. Provide sturdy support. Very cold hardy and permanent. To 14′ tall and 8′ wide on trellis. 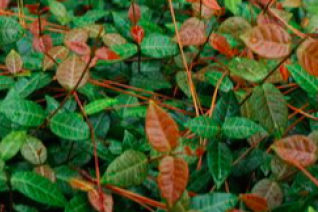 Possible to use it as a small scale ground cover. 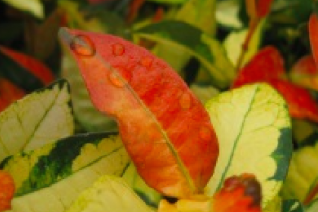 Tolerates full sun but with some leaf discoloration. Regular summer water in well drained soil. Occasionally at the end of the season this species will form twin bean seed pods which are showy as well. 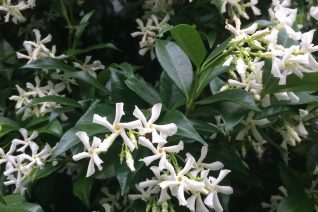 Blooms earlier than Star Jasmine and finishes later as well. 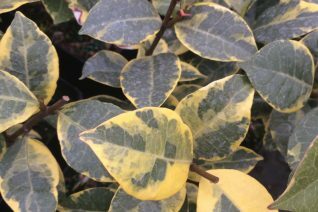 Evergreen foliage is light yellow green- lighter than other species of Star Jasmine. Moderate deer resistance. 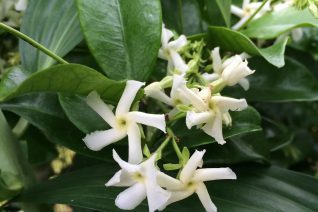 Not a true Jasmine at all but Star Jasmine is a classic summer blooming evergreen vine in our region. 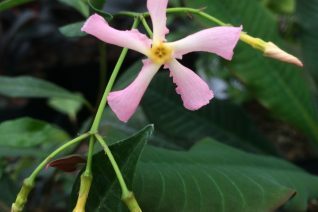 One of the most popular vines and rightly so with its clouds of ivory colored propeller shaped sweetly fragrant flowers for all of summer. Twining vine, provide support- easily guided with the help of #4 gauge copper wire. It has the enviable trait of clothing itself to the ground in evergreen foliage- seldom has bare knees. Full sun to quite a bit of shade, including dry shade. To 12′ tall and 4′ wide in 6 years. Cold hardy to the single digits when established. Can be slightly tender when vines are young- hence the myth that it is not hardy. Regular water in summer speeds up growth measurably. Moderate deer resistance. Drought adapted.